The actual treatment with radioiodine takes less than one minute. However, federal regulations require that we contain the cats in our facility until levels of radioiodine in their bodies fall below federal guidelines. Typically cats treated with radioiodine in our facility spend a total of 3-6 days with us following the radioiodine therapy. The majority of cats are discharged 3 days following their radioiodine therapy. Some cats with larger tumors require larger radioiodine doses and therefore require longer hospitalization periods prior to release. 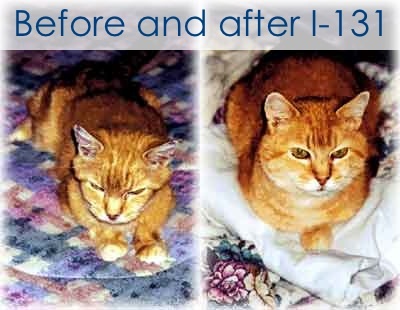 Hyperthyroidism is a disease of geriatric cats. Chronic kidney disease is common in geriatric cats and is currently the single leading cause of death in cats as a whole. 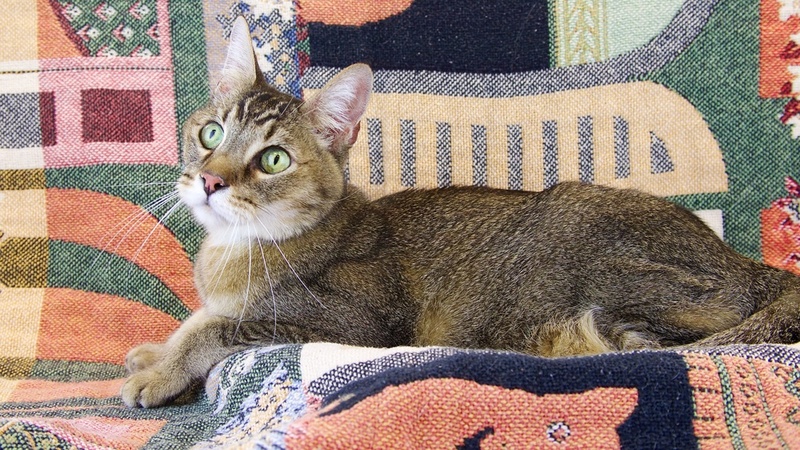 A significant percentage of cats with hyperthyroidism (roughly 30%) have concurrent chronic kidney disease. While there is evidence that hyperthyroidism itself contributes to the development and/or progression of chronic kidney disease in cats, the significant overlap of these diseases is undoubtedly a function of the age at which both conditions manifest themselves. The optimal management of hyperthyroid cats with concurrent chronic kidney disease requires the proactive management of their reduced kidney function. The single most important aspect of supporting kidney function is ensuring optimal hydration. With this in mind, we recommend the use of transient subcutaneous fluid administration for approximately 30% of the hyperthyroid cats we treat with radioiodine. The following 2 videos demonstrate the steps involved in the administration of subcutaneous fluids. While occasional cats can be very hard to give subcutaneous fluids to, most cats really make the process very easy. Before you watch the following videos keep in mind that the biggest obstacle to successful subcutaneous fluids administration is usually the hesitation and even downright anxiety experienced by the person administering the fluids. In addition to the right attitude toward the experience, a key component to the successful administration of subcutaneous fluids is choosing the best location for the task. It is a good idea to take a minute before beginning the process to remind yourself that you are doing this to benefit your cat and sometimes a little "tough love" is the best medicine. In addition to the right attitude toward the experience, a key component to the successful administration of subcutaneous fluids is choosing the best location for the task. The video on this page suggests using any familiar and comfortable location like a couch or counter top. When picking the location to administer the fluids keep in mind that your cat may initially be apprehensive about the experience. Furthermore, while the process of inserting the needle initially seems like the most difficult part of the process, the hardest part about giving subcutaneous fluids is actually preventing the cat from trying to leave the area during the administration process. Understandably your cat may decide that it would rather be elsewhere in your home at the time of the fluids administration. Attempting to administer the fluids on the countertop in an open-style kitchen or on a dining room table or even a couch may present the cat with a large variety of immediately available alternative destinations. Your cat's desire to engage in alternative activities like watching the birds in the yard from a favorite window sill may also represent an obstacle to your timely completion of the task of giving the fluids. Some cats will sense the person's anxiety and simply attempt to hide under the bed or in the back of a crowded closet as a way of escaping the unfamiliar experience. Excessive restraint is guaranteed to make your cat more anxious, almost certainly leading to an escalation of escape behaviors that can rapidly culminate in the need for rodeo-style animal wrangling. The art of gentle restraint, relying on large portions of both encouragement and affection is preferable. Choosing a location in which to administer the fluids that is free of distractions, minimizing the need for restraint, is important to the successful completion of the task. Consider administering the fluids in a relatively small and contained location. Ideally a location without distractions or avenues of retreat are best. Small laundry rooms or bathrooms are good choices. The cat can sit on the bathroom countertop or the top of the clothes drier during the process. Bathrooms or laundry rooms also have the advantage of surfaces that are easily cleaned if some of the fluids leak from the cat during or immediately following the administration. Perhaps the best location for subcutaneous fluids administration is a small, empty space like an empty clothes closet. The closet already has a light fixture for illumination, as well as a bar for hanging clothing (or a fluids bag) on. After entering the closet, close the door behind you and spend a few minutes sitting on the floor, giving your cat affection and reassurance before starting the process. In this environment, there are no distractions for either the person or the cat. From within the closet, the lack of visually available alternate locations within the home help to limit the likelihood that the cat will attempt to leave. Also keep in mind that the rate at which the fluids enter the subcutaneous space of the cat are directly proportional to the height differential between the bag and the cat. The relative height of the fluids bag hanging above the cat in a closet further contributes to a timely completion of the task. Good luck and don't forget to watch the videos below for additional insights. Dr. Mike (from VetVid) shows how to set up subcutaneous fluids for administration to your cat. Dr. Mike (from VetVid) shows how to administer subcutaneous fluids to your cat.